Most-Trusted-Telecom Brand Bharat Sanchar Nigam Limited (BSNL) has introduced Voice Call Special Tariff Voucher under 2G and 3G Prepaid Mobile Services. 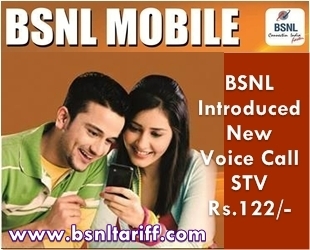 Special Tariff Voucher (STV) Feature: Local Voice Calls to Any Network at Rs.1.2p/2Seconds, with Validity for 90 days. After sending the SMS for activation of the above voice STV Rs.122/-, amount of Rs.108.58/- will be deducted from customer main account balance. The above STV applicable as long as the customer is in Home LSA only and while in roaming necessary charges as per the plan will be charged. The above STV is available for current plans, Saral Anant and New Nesam special plans only. New above Voice Call STV will be implemented and with effect from 10-09-2013. Existing STV of MRP Rs.132 with the same feature is withdrawn with effect from 10-09-2013.